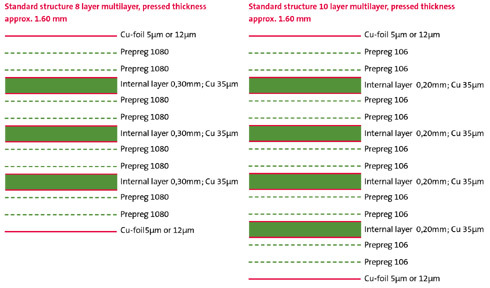 With this product information, we would like to supply you with basic details about the structural options, tolerances, materials and layout guidelines for multilayer boards. This should make your life easier as a developer and help to design your printed circuit boards so that they are optimised for manufacturing at lowest cost. As a supplier of prototypes and rush deliveries, CONTAG has a selection of standard materials with which a large bandwidth of the variety of types of PCB can be covered and which are always available in house. Requirements for other or for special materials can also be met in most cases, but, depending upon the exact requirements, up to about 5 working days may be needed to procure the material. Do get in touch with us and discuss your needs with one of our sales or CAM team. If you would like a defined thickness of dielectric between the external layers and the first internal layer, then you can choose this type of construction. For this technology, there may be restrictions on the design of the layout for the outer layers as well as on the availability of the material. Discuss your needs with our sales department. They will provide you with reliable and competent advice. CONTAG can produce multilayer circuit boards with blind and buried vias, even as a rush service. You will find important information and layout hints in our technology information sheet "Blind vias". When special layers are requested, we have a simulation programme, with which we can determine the exact insulation spacing, the degree of resin fill and the er value between the individual layers. It is also possible to precisely calculate the final thickness. To do this we need the complete layout for the internal layers.